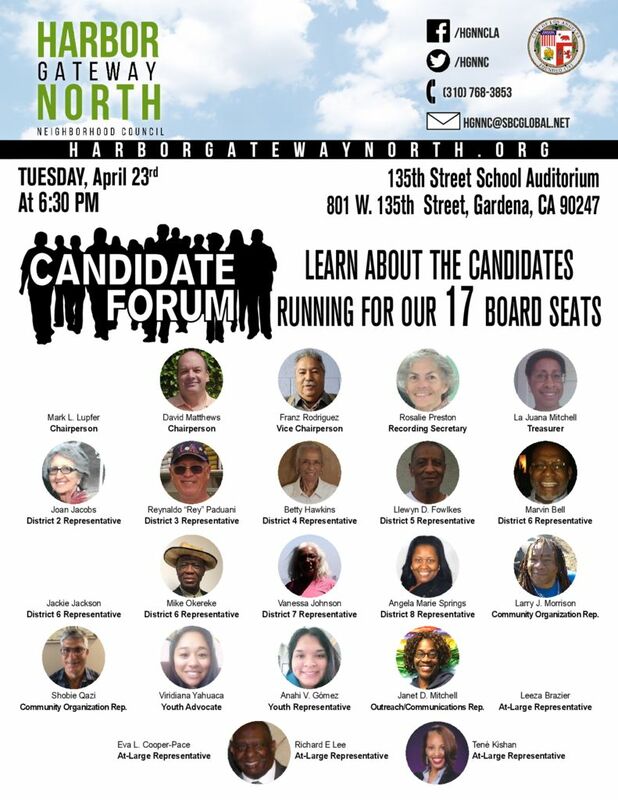 Come and meet the candidates running for the Harbor Gateway North Neighborhood Council!! 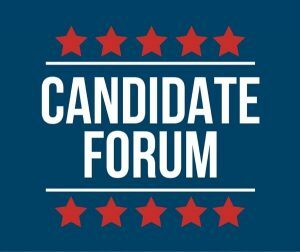 Ask questions and listen to what issues the candidates care about. 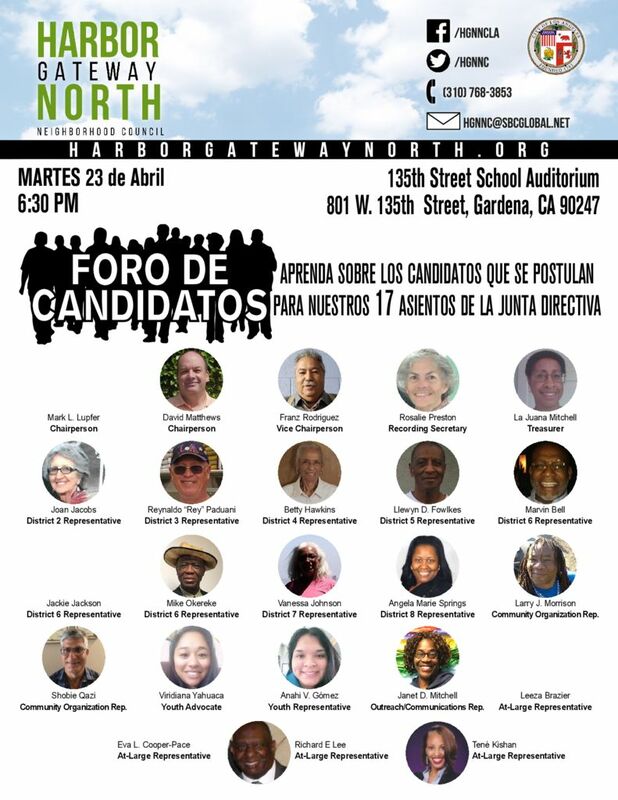 The forum will take place on Tuesday, April 23rd from 630pm to 9pm at 135th Street Elementary School located at 801 W 135th St.
We are collecting questions to ask the candidates. Please use this form to send us your questions ahead of time by April 22, 8pm. 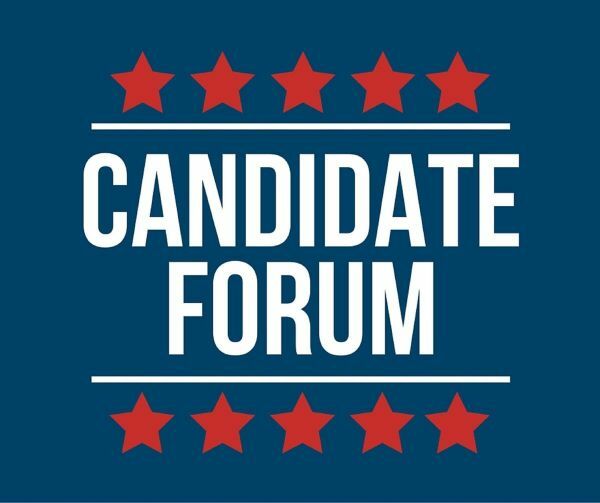 We will compile them and have a moderator ask the candidates. Non-profits should use the Neighborhood Purposes Grant form only. District Representatives and community members should use both the HGNNC Funding Request Form 2019-2020 and also the NC Event approval form. The Los Angeles City Council today voted unanimously 12-0 AGAINST the terrible gentrification law, SB 50, being peddled by state Sen. Scott Wiener. City Councilman Paul Koretz slammed the widely-ridiculed SB 50 as “trickle down economics” that would gentrify much of Los Angeles and force the city’s large working class further away from their jobs. Koretz said Wiener’s vision of erecting 6-story to 8-story buildings in thousands of low-rise and single-family residential areas is focused on the wrong questions and wrong answers. Wiener “has called single-family homes immoral” and his bill would destroy yards and space to raise a family in L.A., Koretz told the packed and cheering Los Angeles City Council chambers. Council members David Ryu and Mike Bonin cited their own long lists of objections to the misguided bill. “Los Angeles has 100,000 fully approved housing units that have not been built” by developers, Koretz said. It would be absurd to invite developers to now wipe out vibrant existing neighborhoods while they sit like gloating toads on land they can develop right now. Angelenos you were awesome today. You came downtown to City Hall this morning to oppose SB 50 from San Fernando Valley, South L.A., Koreatown, Eastside, Northeast L.A., Westside, West Adams, Boyle Heights, Crenshaw, Sunland-Tujunga, Hollywood and more. THANK YOU ANGELENOS! Your next fun, easy, duty happens right now! Let’s build on this HUGE success. 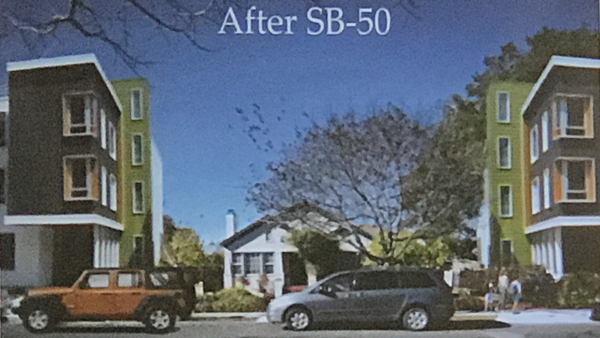 HGNNC voted to oppose SB 50, which would allow very dense development, even in single-family zones, if they are near bus routes or light rail or jobs centers. This would mean almost every part of our Neighborhood Council area. Meanwhile, there are not any strong guarantees that the new housing will be affordable or help with the housing crisis. The Harbor Gateway North Neighborhood Council Planning and Land Use Committee has been meeting for six months to carefully review zoning concerns by district. Their recommendations were reviewed and approved by the HGNNC Board as a whole and were sent to Vince Bertoni, Director of City Planning on April 12, 2019. The City of Los Angeles Department of City Planning will hold Planning 101: Planning for the Environment trainings in the month of May in collaboration with the Department of Neighborhood Empowerment. Seven Planning 101 trainings and one online webinar will be held in the month of May 2019. The training will include an educational presentation, an interactive scenario activity, and a question and answer period. For more information please see: https://planning.lacity.org/documents/ExternalAffairs/Planning101_Planning_for_the_Environment.pdf. Please RSVP at http://bit.ly/P101Env. It’s been a big year for our work to end homelessness in LA and we want to celebrate with YOU at HomeWalk 2019! Join United Way’s Home For Good and Everyone In teams on Saturday, May 18 at Grand Park for our annual HomeWalk 5K family run/walk to raise awareness and funds to end homelessness. This year, there will be the usual fun of partner booths, food trucks and live music, with more onsite engagement and entertainment than ever before, thanks in part to a new presenting event sponsor, LA RAMS football. Picking your Team Captain to help communicate, coordinate and, most importantly, be a cheerleader for your team. Or, consider taking up the charge yourself! 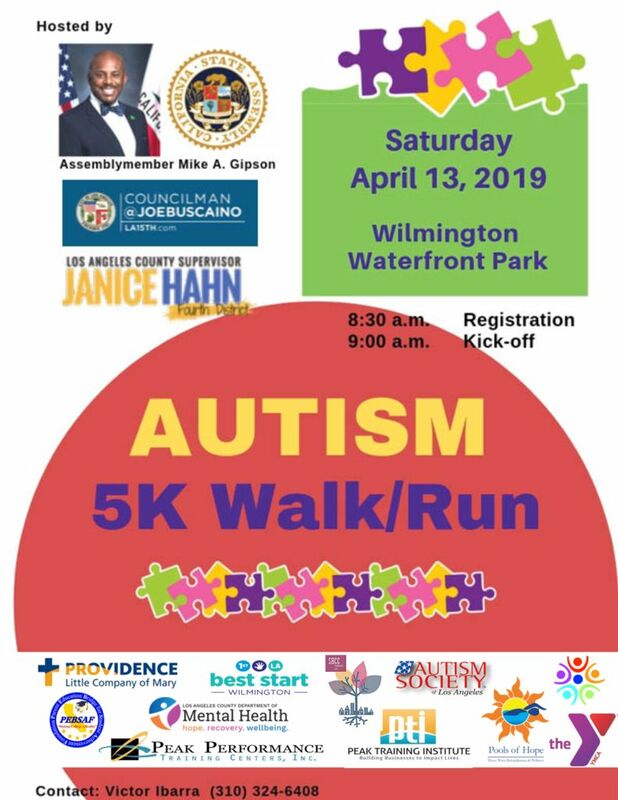 Have your Team Captain register and create a “New Team” at https://homewalk.unitedwayla.org/. Send the word out to friends, family, and coworkers to create an account and join your team using that same website. Everyone In! HomeWalk is welcomes everyone in for a great day of celebrating together. The path to ending homelessness is a collaborative effort that takes all of us. 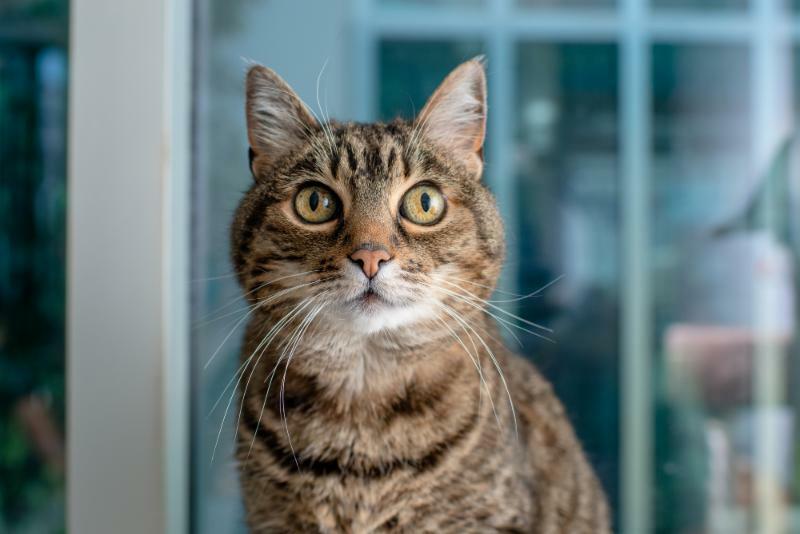 Your donation creates broad systemic solutions while also offering on-the-ground support that our homeless neighbors need now. This includes permanent supportive housing, strategic investments in research and innovation, capacity building, system connections, and community engagement needed to end homelessness for good. “The highest human act is to inspire,” said Nipsey Hussle, born Ermias Asghedom, and he did. 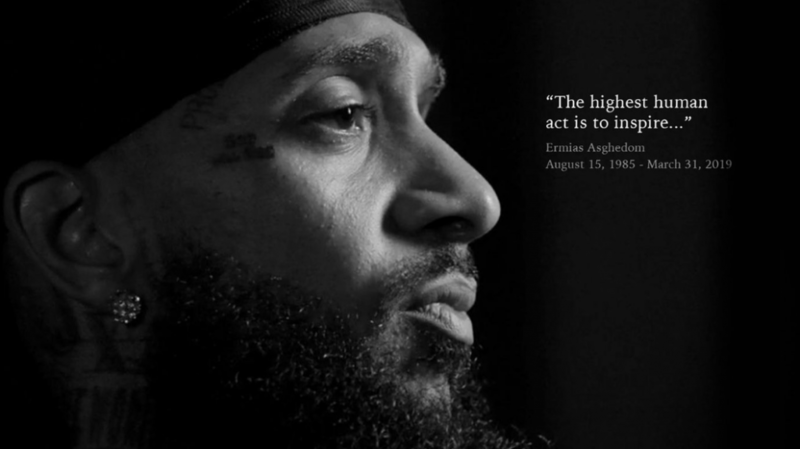 The Los Angeles Times and many other media outlets have been lamenting the loss of South LA Native Nipsey Hussle who was murdered March 31 in front of his own clothing store in Hyde Park at the young age of 33. Other than being a rapper, what he was most known for was choosing to stay in his neighborhood and invest in it, even though he could have moved out. The Neighborhood Council Budget Advocates is a group of Neighborhood Council Members who come together and make recommendations on the City Budget. This year they have not only issued their White Paper with comments and recommendations about the budget, they have also issued a Position Paper The Legacy of Redlining in Los Angeles FINAL which states that the crisis of high rents, displacement, homelessness, budget shortages and other injustices identified in the 2019 White Paper can be attributed in part to the legacy of redlining.